This last time was the shortest time between bakes—just three measly weeks. The circumstance surrounding this issue was a little different than the previous times if nothing more than the coincidence of having it happen the day after I made a scheduled visit to my local Apple Store in Spokane (deliberately on Steve Jobs birthday, 2/24 hoping to take advantage of any extra reality distortion fields that might be present) to try one more time to have them test my system to see if it would produce the Nvidia error (see my first article: Cooking The Books). I have to take my hat off to the two techs (er, geniuses) that tried everything they could think of to get it to produce the Nvidia error (I’m pretty sure there were some serious voodoo incantations involved) but alas, to no avail. My system was perfectly fine, or so it would seem. I was entirely honest with them about the history of my system and told them all about my baking experiences and they seemed genuinely appreciative that I had been so forthright and seemed to go the extra mile as a result. But, the final verdict was that the system appeared to have no issues that would qualify it for the Nvidia repair policy or any other policy. In short, I was hosed if my board ever refused to come back from the dead. They did encourage me that if I had them send my system to the main Apple Repair Center that there was a good chance that they “might” be able to replace the logic board for the minimum $310 but, that if it was determined by the tech that accidental damage had occurred like being dropped or spilling a Mountain Dew on the keyboard (which has never happened) or the premature yellowing of all the stickers from being baked several times and slightly stripped hex screws (that has definitely happened) that I would be liable for the whole cost of replacing the board which was still $1100 at the time of their quote. I went home disappointed but thankful my system has been able to go through its repeated resurrections and that I would wait until it died again before taking my chances and bringing my system in. Little did I know that would happen to be the very next day. Lo and behold, that very night, I closed my system just to transport it into another room and when I went to open it, it would not wake up. Now in the past when this occurred, I had gone through many troubleshooting steps which would always involve doing a hard power down by holding in the power button for several seconds. Once that had taken place, it has never recovered on its own without baking. All of the times that I had had the system looked at by Apple techs, the system had been powered down. This time though, I thought I would try to take advantage of the fact that it was still “on” but dead—hoping that there might be some forgotten voodoo chant that could be summoned that would shed light on the root cause of my system failures. I decided to leave my system on and I scheduled another Genius Bar appointment as early as possible the next morning. Now Coeur d’Alene isn’t that far from Spokane. 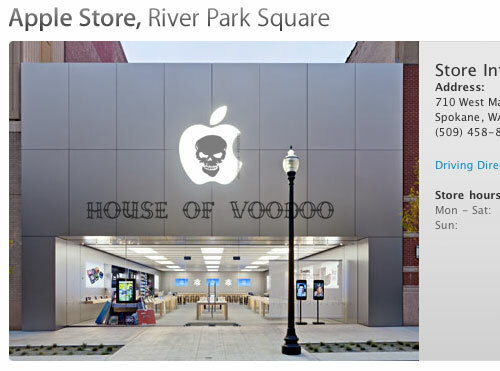 It’s only 35 miles from my door to the downtown Spokane Apple Store location but 70 miles round trip (which I used to make every day for quite a few years). But it takes about 45 minutes each way and almost a quarter of a tank of gas in my Jeep so you don’t make the decision to go into Spokane if you don’t have to. That said, my expectation was that I was taking advantage of this “powered-on” condition hoping it might make a difference in diagnosing the problem. However, when I finally slid my MBP onto the Genius Bar counter to have a new tech, er, genius, take a look at it, I tried to be very careful in explaining the situation of the “on condition” to which he unhesitatingly responded to by immediately powering down the system, to my dismay, to go through all the same troubleshooting techniques that I told him has already previously been done many times over. Which, predictably resulted in the same result—nothing. Now, to give the guy a break, there’s probably nothing that could have been done, but I would have at least liked for him to have acknowledged and appreciated the fact that I was hoping to take any possible advantage of the “on condition” and then tell me why that wouldn’t make any difference. Instead, the impression I had was that he didn’t hear anything I had just said and went into robot-mode and instinctively powered the system down—doh! Well, I turned around and drove back the 35 miles home in 45 minutes and another eighth of a tank of gas, completely disappointed. I then proceeded to bake the system for the sixth successful time. The difference this time is that on the way home, I stopped at Radio Shack and picked up a small tube of Arctic Silver 5 thermal paste. This is the one thing that I have not done on any previous baking attempt. In my defense it wasn’t mentioned in some of the other articles and videos that I had used for my initial research so I didn’t think that it was really necessary. As it began to dawn on me that this was probably the main culprit behind the fact that I have had to bake the system multiple times, I had resolved that the next time I would make sure to apply the step of thoroughly cleaning off the old thermal paste residue and applying the new paste. I have now had the system up and running for over a month now (so longer than last time but still aways from the four month record) so I think that the thermal paste has made the difference. There were some other complicating issues between the fifth and sixth bakes besides the voodoo visit to the Apple Store and that was that I had upgraded to OS X 10.6 Snow Leopard and swapped out my old 250GB hard drive for a new 500GB. I had noticed after upgrading to 10.6 a dramatic increase in fan usage so I am suspicious that it may have also played a role in the shorter timespan between bakes 5 and 6. Well, now onto the “hope” part. That same afternoon after I got home and got my system back online, it just so happened that I had received an email invitation to partake in an online survey of my experience with the service of the Genius Bar…so, I told them, in a respectful and kind but lengthy response of my disappointment. That evening I received a phone call from the store manager where I reiterated in more detail my story to which he seemed genuinely motivated to try to take care of my situation and make it right. I was able to get his word that if I decided to bring my system in for repair of the logic board that he would have the store do the repair rather than sending it out to Apple’s Repair Center and guaranteed that it would only cost me the $310 to replace the logic board (assuming that was the only thing wrong). While free would have been obviously better, I consider that a pretty good deal considering the original Apple Care was for $250 (which I should have paid for), I’m only out another $60 more than that. So, now the only thing is finding the time in my schedule along to take advantage of this offer. Meanwhile, my hexed system keeps on keeping on. Been following your posts. I have baked my Macbook Pro for 3 times already since the time it started that Logic Board problem 3 months ago. I think I must be a pro in assembling and disassembilng my MBP that I can now do the entire thing in 30 minutes as compared to 2-3 hours during the 1st time I did it. Thanks! Do give us updates about your MBP. I know what you mean about getting faster at tear-down and re-assembly. I’m curious if you have done a thorough cleaning of the old thermal paste on the processors and heat sinks and replaced with new, quality thermal paste? My first 5 bakes were without doing that and I only had one bake last for over 3 months (4 months). But since my last bake back in February, and applying the new thermal paste, I have been up and running for going on 7 months. What has been your longest time up and running between bakes? I’m curious to know if you applied thermal paste for the previous times you baked the logic board. Are you attributing the success specifically to the popular Arctic Silver 5 thermal compound, or just the use of any thermal paste? I’m asking because I wasn’t able to pick up a tube of Arctic Silver 5, so I went with this other compound called Arctic Cooling MX-2. I applied thermal paste only the last two times that I had baked the board (total of eight times). The first time I applied the new paste it increased time between bakes to 6 months (the longest it had gone between bakes after only lasting 3 weeks from the previous bake) and the last time lasted about 4 months. There will be no more baking because Apple finally ponied up and replaced the logic board (more on that in another post). I’m thinking that while I would have still had repeat bakes, they may have been fewer and far-er between. 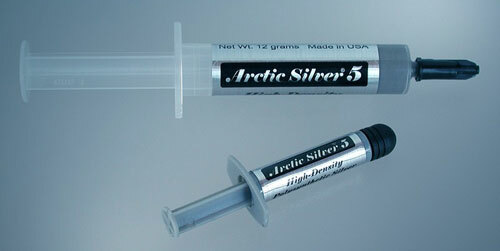 As far as the brand of thermal paste, I don’t necessarily attribute it to Arctic Silver 5 other than it is a higher-quality thermal paste. There are better ones available, but the fact will remain, that even just good thermal paste will beat no thermal paste replacement. The better you get–the better it will be (profound thought for the day). Thanks for the timely response. Please let me know how you convinced Apple to replace the board. My Mac is currently 4.5 yrs old, so I’m not sure if Apple would even replace it. However, I encountered momentary problems with my display within the initial 4-year period. When I took it in 3 months ago, I failed to get the error code and the external display test didn’t show any symptoms. My Mac won’t start properly exhibiting the following symptoms: no chime, no recognition of ram (switching or removing), faint light (glows brighter when lid is closed), and fans spin. But I managed to get it work after hitting the power button, wrapping it in a quilt to cover the vents, and then leaving it upside down for 2 hours. (The machine turned off on it’s own once it reached a certain temp). I let the machine cool to room temperature. I got it working normally for about a week before it went back again. So I really hope your “recipe” works. Any instructions for removing and applying the thermal paste? Honestly, I would just Google it. The key is being careful. For me, I used a paper towel to wipe up the majority of paste. I then took a terry cloth rag (shop rag–don’t use your nice bathroom washcloths) and used that to carefully wipe the remaining residue being careful to not leave debris from the cloth on the board. For application, just follow the instructions provided with your paste. Finally, be careful inserting your board, because once it has contact with the paste, it can get wiped on other areas if you’re not able to get it seated properly in that first try. I just wanted to say THANK YOU for your posts – they are wonderful. I came across them by the Mercy of God when my mid-2008 15.4″ MBP suddenly died around fortnight ago, just when I really needed it. I intend to try baking the logic board and hope that it will work until I can afford to buy a new computer. (I’m working on a relative’s at the moment). Hi, can someone tell me if baking the logic board will change its color or something? I mean, can someone could tell that the board has﻿ been baked just by looking at it? You will only notice a slight yellowing (or aging) of any of the white stickers that are on the board. Nothing major, but perceptible. My 17″ Santa Rosa started to do this thing were it would boot and chime but there was no display. After some troubleshooting I decided it was the graphics card. Luckily someone mentioned baking my logic board as a possible solution and I found my way to your posts and a few other forums and decided to go with a heat gun (rated for 400 degrees) to try to reflow my GPU: I warmed the underside, then concentrated the heat on the card for 20 min. I am now posting from the ole’ MBP and am still somewhat flabbergasted by how well it worked. Thanks very much for documenting your experience with baking apples! It’s nearly 2014 and Im so pleased my MacBook Pro lasted lasted longer than expected. Having said that, I am completely dismayed that my machine finally died like all of yours. What seems very co-incidental is that quite a few of these models died 2 weeks ago. Obsolescence built in? Time Bombed? I explained that I love this MacBook like loving an old vintage car. (it’s not that old) but I guess in computer terms its getting on. Though, I have a MacBook Pro G4 and another MacBook G5 working stunningly! Old OS, but they work great! It seems that this particular model was destined for obsolescence since day 1. I find this outrageous especially when you pay such a premium for Apple products. I paid nearly $7000 in Australian dollars for my original MacBook!!! It is sad that Apple is now into total obsolesce every 2 to 4 years. With all the Glue, batteries behind the motherboard..etc (ifixit.com) it is a sign that a massive change in culture is needed to demand priority that we can’t afford this obsolescence, especially for our environment and all or our wallets. So, I baked it…followed all of your tips and the little bugger is waiting for the Thermal compound to arrive from Amazon on Monday. Crossed fingers I’ll get my beloved MacBook A1261 back. I know this is an ancient rant, but my Early 2008 2.5Ghz 17″ Macbook Pro lasted up until about 6 months ago, when it finally succumbed to dreaded the NVidia issue. The unit had been ugraded over the years with 1) 256GB SSD boot drive, 2) 500GB Hybrid HD secondary drive (replacing the optical drive), and 3) 6GB of RAM (maximum supported). It had just gotten to the point of being near-unusuably slow, when I (finally) upgraded to Mavericks which brought a new breath of life to the old gal who had just had her 6th birthday. Unfortunately the video went a few weeks later. 6.5 years for any computer, let alone a laptop, is far from “planned obsolescence” by any definition. Super super thanks on this! Salvaged my MacBook Pro and worked like a charm. I used a solder reflow station to program in this profile but I stepped up the time/temp a little bit longer upon examination with a magnifying glass. I think the key was flooding the chip with flux. Used this profile. Why do I have to keep throwing this bloody logic board in the oven.. isn’t there a way to re-solder the gpu back onto the board? My guess is that the solder they used was junk and every time you ‘bake it’ you are essentially melting the solder again on the logic board..
either that or resetting the ICs on the motherboard itself..
not sure.. can you provide any insight? Thanks for this! I baked my early 2008 MBP for the second time last night, at a higher temp: heated the oven to 428 F, then dropped it to 392 when I put the board in the oven – for 7 min following the instructions here: http://www.instructables.com/id/How-to-repair-the-Macbook-pro-logic-board-at-home/ The baker in this link let his board cool in the oven – which I decided not to. My last fix lasted about 2 months (I think its life was shortened after toting it around, maybe the fragile solder broke free). Other tips: Cleaning the fans, heatsinks and vents is something you should do as long as you’re in there, also clean off the old thermal paste and add new (I read somewhere you don’t need to use too much). I also decided to drill some holes under the fans (see the ifixit post). Assembly and disassembly was aided by the wonderful ifixit repair guide (look for logic board replacement). I use iStats Menu to monitor temperatures and fan speeds. I’ve gotten used to traveling with an iPad, but there are a few things only the old MBP can do. I’ve replaced the MBP at home with a mac mini for the time being – but it’s nice to have a laptop. I’m hoping this fix lasts a while, and until I can replace it. Preparing to bake my mid-2008 MacBook Pro for the fourth time. My third and most successful logic board baking session was 4 and a half years ago! Considering it’s my only computer and gets used daily, I’d call that a complete success for a computer the so called Geniuses left for dead five years ago.